The apartment is situated in El Faro, a privileged area of the costa del sol between fuengirola and Marbella .It is only 30 minutes drive from Malaga airport and the capital of the province.The apartment overlooks the Colinas del faro mountains.It is a popular area for holidays as it meets the requirements of even the most demanding of people,given the outstanding climate we enjoy all year round. There are beautiful views both to the sea and mountains and it benefits from the diversity of sports in the area,tennis,trekking bird watching,water sports etc. There are also several golf courses in the area within easy reach. Briefly the accommodation comprises of lounge/dining area, kitchen/utility with washing machine. There are two bedrooms master bed with en-suite.The second bedroom has a shower room next to it. Doors from lounge and master bedroom lead onto a private balcony with sea and mountain views. 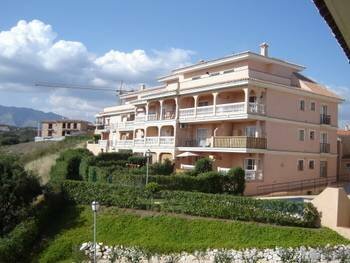 The apartment is fully furnished and well equipped.The apartment has air conditioning and heating. There is a shared pool and the apartment is in a gated community.There is a small local beach 5 minute walk away.you willfind a variety of eateries and bars to suit all tastes.There is a small mini market nearby,they provide freshly baked bread,pizzas and cooked chicken by order.There is also a local supermarket.